This topic describes how to use Spatial Sound in your Unity projects. It covers the required plugin files as well as the Unity components and properties that enable Spatial Sound. Your Unity project is now configured to use Spatial Sound. If you aren't using a Windows 10 PC for development, you won't get Spatial Sound in the editor nor on the device (even if you're using the Windows 10 SDK). 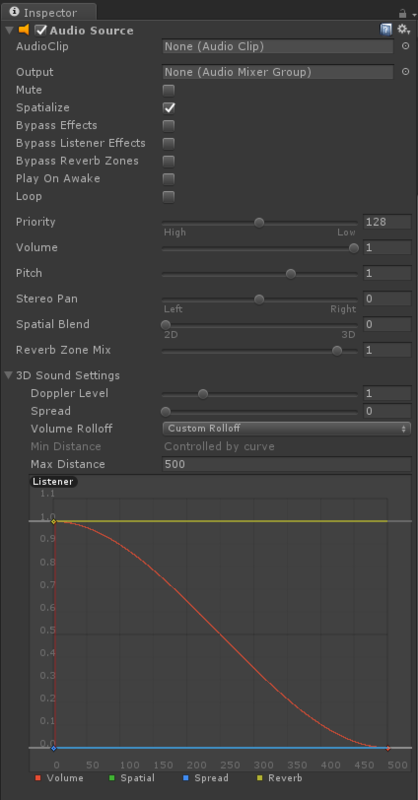 Spatial Sound is used in your Unity project by adjusting three settings on your Audio Source components. The following steps will configure your Audio Source components for Spatial Sound. In the Hierarchy panel, select the game object that has an attached Audio Source. Set Spatial Blend to 3D (numeric value 1). For best results, expand 3D Sound Settings and set Volume Rolloff to Custom Rolloff. Your sounds now realistically exist inside your project's environment! It is strongly recommended that you become familiar with the Spatial Sound design guidelines. These guidelines help to integrate your audio seamlessly into your project and to further immerse your users into the experience you have created. The Microsoft Spatial Sound plugin provides an additional parameter that can be set, on a per Audio Source basis, to allow additional control of the audio simulation. This parameter is the size of the simulated room. The size of room that is being simulated by Spatial Sound. The approximate sizes of the rooms are; small (an office to a small conference room), medium (a large conference room) and large (an auditorium). You can also specify a room size of none to simulate an outdoor environment. The default room size is small. 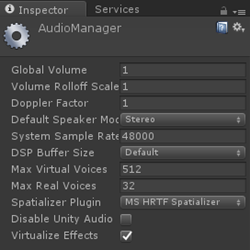 The MixedRealityToolkit for Unity provides a static class that makes setting the Spatial Sound settings easy. This class can be found in the MixedRealityToolkit\SpatialSound folder and can be called from any script in your project. It is recommended that you set these parameters on each Audio Source component in your project. The following example shows selecting the medium room size for an attached Audio Source. If you don't want to use the excellent Audio tools in the MixedRealityToolkit, here is how you would change HRTF Parameters. You can copy/paste this into a script called SetHRTF.cs that you will want to attach to every HRTF AudioSource. It lets you change parameters important to HRTF. public ROOMSIZE room = ROOMSIZE.Small;  // Small is regarded as the "most average"
The following examples from the Mixed Reality Toolkit are general audio effect examples that demonstrate ways to make your experiences more immersive by using sound.